Mission: Summit Mt. Bierstadt (elevation 14,060') in winter. 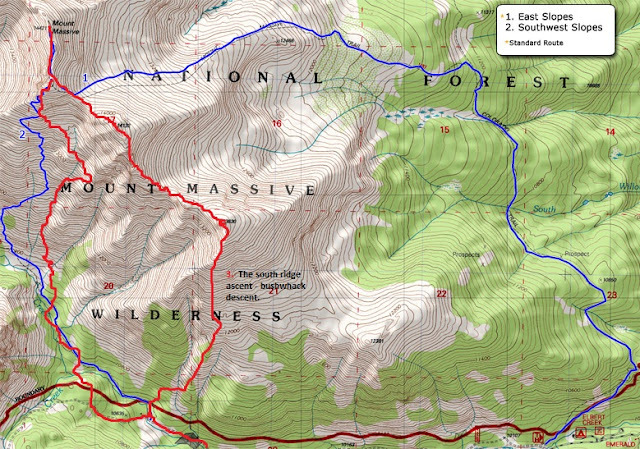 Elevation gain: Estimated 3350 ft.
On September 1st of 2011, I hiked Mt. Bierstadt with my daughter. It was her very first 14er, and my 7th at the time. September 1st 2011 - my daughter and I on a ridge leading up to Bierstadt's summit. Fast forward 16 months and it's now Jan 19, 2013 and I am coming off my 34th 14er and possibly my most adventureous climb yet on Mt. Massive. A few short days later, I just wanted a relaxing hike on this Saturday, so I chose to do a hike of Mt. Bierstadt with my friend Joel. Joel and I had hiked Wetterhorn, Castle, and Belford together, and was trying to nab his first winter 14er summit. We started at the winter road closure on the Georgetown side of Guanella Pass. This adds about 3 extra miles and maybe 500ft vertical round trip by my estimate. The hike up the road went quickly in the early morning, and we were at the summer trailhead in no time shortly after sunrise. We began the route down through the willows and past a lake where I remember seeing several moose in the summer of 2011. September 2011 - Moose chillin by the lake. September 2011 - Lake near the willows on Mt. Bierstadt. Joel and I made our way quickly through the willows and began to gain some elevation on the first of a few climber trails. January 2013 - Joel climbing up out of the willows. The weather forecast had tricked us a bit today. It was colder than forecasted by far, but much less windy than forecasted. It was probably a high of 10 F all day, but the forecasted winds of 20 - 30 mph did not manifest themselves. At worst, we saw some breezes in the 10 - 15 mph range. Although this is still enough to make 10 F feel like -10 F.
The trail was hit and miss in the snow, and mostly we just went up towards the summit, with the occasional post-hole in knee high snow. January 2013 - Joel trying to step on my shadow's head. January 2013 - Joel pictured with a piece of Mt. Evans in the background. Joel was not feeling 100% and started to have some symptoms of a mild case of AMS (a.k.a altitude sickness) and his pace started to slow quite a bit as a result. This just happens from time to time. I turned around on Blanca Peak in Dec at 12,000' due to the same symptoms. It's just part of life when you climb mountains. Knowing when to push through it and when to turn around is key to one's safety though. So, around 13,600', Joel made the decision to leave this summit for another day. A decision I completely understand and respect. I pushed on for the summit and was rewarded with views of the front range in winter, but also memories of hiking this with my beautiful daughter in September 2011. January 2013 - Summit views with Grays and Torreys peaks at the far top right of the photo. September 2011 - Myself and my daughter - same view / less snow. On the summit, I met a great guy Johnathan from Colorado Springs who'd just returned from war in Iraq a few months prior. I thanked him for his service and we exchanged various mountaineering tales. When he began his descent, I was left in solitude on Mt. Bierstadt's summit. This is unusual. In the summer, it's common to see dozens or even hundreds of people on this summit. I waited for 20 minutes for Joel, not knowing he had turned around. I kept warm by doing push-ups, and running laps around the summit. Finally another climber made the summit and informed me that Joel had turned around, so I immediately began my descent. Joel was waiting for me around 12,600' and I caught up to him in short time. We hiked down the rest of the way just enjoying the now slightly warmer day, dreaming of what food we were going to destroy when we reached civilization. The hike back down the closed road gives a last memorable view of Mt. Bierstadt. Mission: To finish what I started a year ago and summit Mt. Oxford (elevation 14,153 ft.). Another summit of Mt. Belford (elevation 14,197 ft.) was needed to get to Oxford. Who: My friend and climbing buddy Joel Snow, and myself. Joel getting his gear ready at the trailhead. ﻿﻿﻿﻿﻿﻿﻿﻿﻿﻿﻿﻿﻿﻿﻿﻿October 15th, 2011, I made my way to the summit of Mt. Belford with the intention of going to Oxford. On this day in 2011, it was incredibly windy and I didn't have nearly the good gear that I have now, and didn't even own a "shell". So, that day I skipped Oxford and told myself I would be back. Well, on December 1st 2012, Joel and I made our way to a nearly empty Missouri Gulch trailhead. There was only 1 other car there on a Saturday afternoon, which is strange even in the winter. We began our hike to a camp in the early afternoon. The forecast, as fate would have it, was calling for high temps in the teens with 35 - 50 mph winds with gusts up to 60 mph on both Saturday and Sunday. Our intention on day 1 was to hike up in elevation about 1700 ft. to a camping spot near the reminants of an old shack at 11,250 ft.
Our campsite near the old shack at 11,200 ft. The hike up to camp was quiet and uneventful. By 4pm, we had camp set up, water filtered from the nearby creek, and we built a small fire to keep us warm while we ate dinner. After our dinner, we put out the fire and crawled into our tents and listened to the wind howl and shake the walls of the tent for the next 8 hours while we tried to sleep. Sleep was intermittent at best. We were up and hitting the trail in the dark on Sunday morning at about 5:45am. Daylight dawns on the Sawatch range. It was a cold morning, the wind certainly wasn't helping either. Joel stopped to put some toe warmers in his boots and I kept plugging away üp the steep trail to the ridge. As far as I could tell, Joel was either battling a cold or maybe mild altitude sickness, and was clearly having a physical and mental battle with himself on this day. I understand how those days are, so I just offered encouragement, and tried to give him the space he needed for his battle. Twice, the wind gusted so hard that it knocked both Joel and I off our feet causing us to fall off the trail. Regardless of the wind and the cold, as long as I was still moving, I was feeling great. My eyes were still solely set on Mt. Oxford. The views improved with each step we took. By 9:30am I had reached the summit of Mt. Belford and was taking in the views and fueling up for my attack on Mt. Oxford. On the summit of Mt. Belford. Did I mention it was windy? Joel making his way to the summit of Mt. Belford. By 10am, Joel joined me on the summit long enough for me to tell him I was heading to Mt. Oxford. He still was not feeling a 100% and decided to leave Mt. Oxford for another day. We agreed to meet at the campsite no later than 4pm. This means at my normal pace, I would have to waste little time. It's 3 miles and 1300 ft. in elevation gain round trip just to get to Oxford and back to the summit of Belford. I made my way quickly down the ridgeline to the saddle between Oxford and Belford. It was along this saddle that I experienced the strongest winds of the day. I was wearing a black REI Spruce Run insulating layer over my Montbell softshell because I got tired of switching layers rather than just removing one from time to time. This would prove to be a mistake when a wind gust caught a hole created by the zipper in the armpit of the REI layer. The wind literally ripped the sleeve off my jacket by breaking the zipper. I was now wearing an insulating layer that had one sleeve and one side as a vest. Half of me was cold, pissed that my jacket failed in the conditions it is needed for, and the other half of me was just laughing. It was sort of humorous to be walking a ridge with only one sleeve on the jacket. WTF - On the summit of Mt. Oxford is a Bible in a tupperware container and a toaster. The climb up Oxford was tiring, but I eventually made it. The views from the summit proved worth it. Views from Mt. Oxford looking east. Looking back at Mt. Belford from Mt. Oxford. If you look closely, you can see the trail on the ridge. I made it back to camp by 3:30pm and Joel had already packed my sleeping bag and tent up so I just needed to throw some stuff into my backpack and we were off. We made it back to the trailhead with a few minutes of daylight to spare. Another memorable adventure in the Colorado mountains was in the books. For those that are wondering, I did replace my jacket with a jacket with two sleeves.